1. Moisture, humidity and even warmth can shorten most seed shelf life. If the seed could have gotten moist while handling, they need to be air dried before being put in storage. Spread the seeds on newspaper and let them thoroughly air dry for about a week or at least a few days. 2. Put the air-dried seeds in small paper packets or envelopes, and label with plant name, date and other information. Packets should be kept in plastic food storage bags, plastic film canisters, glass jars or other containers with tight-fitting lids or seals. Putting the seeds in 4 layers of facial tissue before going in the packets is preferred by some. Some columns and web sites recommend talcum powder or silica gel on the seeds and replacing the drying powder every 6 months. I have used natural diatomaceous earth for this purpose in the past and it damaged the seeds by dehydrating them, so I no longer recommend this step. 3. 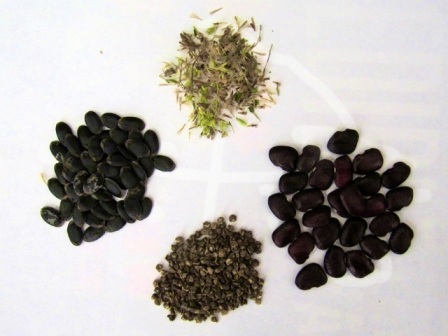 Store seeds in the refrigerator at temperatures of 35-45 degrees. Do not use the freezer because it could be damaging. 4. Date each batch of seeds and keep each season’s seeds separate. Some say that seeds last about 3 years but following these steps will give you a much longer period of time in most cases. Some seeds can last for decades. 5. Next season, remove seed containers from the refrigerator and keep them closed until the seeds warm to room temperature to help prevent the seeds from clumping together. If you're in a hurry, this isn't a big deal. 6. Finally, if you want to save your own seeds, and I recommend that you do, you’ll need to plant open-pollinated varieties. They’ll come back true to the mother plant – most of the time, but the hybrids won’t. There’s no telling what you’ll get from them – if anything. Products for pest control, lawn and garden care are available in independent garden retailers that stock organic products and online. Also products are available in the Dirt Doctor's Corner of your favorite garden center.